In his 1822 compilation of “detailed accounts of the various cases,” Sake Dean Mahomed included this artist’s view of his bathhouse on the coast in Brighton, England. Inside, customers found frescoes showing fruit trees and gardens “in the most glowing colours with Indian landscapes.” The building stands today as a hotel. A colored lithograph shows Sake Dean Mahomed circa 1820, six years after he started his steam-bathing business, which he promoted through books including this one, below, published in 1826. He is wearing an ensemble based on traditional Indian attire. 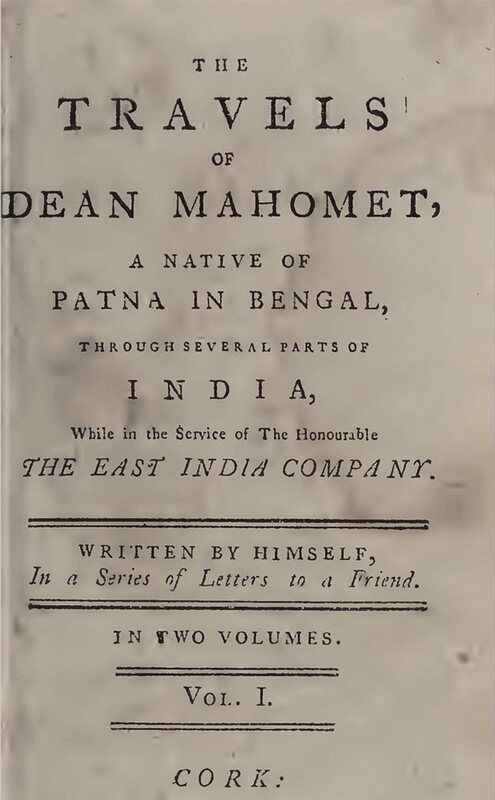 Historian William Dalrymple titled his 1998 review of The Travels of Dean Mahomet: An Eighteenth-Century Journey through India, “An Indian with a Triple First.” It was an apt choice: The Travels was the first book ever published by an Indian writer in English, and the author was also the founder of London’s first Indian restaurant. To complete his hat trick, Mahomed—the spelling he used later in life—made a lasting name for himself in the English seaside resort of Brighton by bathing the royal, rich and famous. Mahomed’s Travels would have remained confined to the rare-book sections of the few great libraries that hold an original copy if it were not for Michael H. Fisher, a professor of history at Oberlin College in Ohio. He persuaded the University of California Press and Oxford India Press to republish Mahomed’s memoir in 1996 complete with his own biographical sketch of Mahomed. Last spring I spent a week in London and Brighton tracing the footsteps of Dean Mahomed, which is an Anglicized version of his given name, Din Muhammad. I sought out first Rozina Visram, whose 1986 book Ayahs, Lascars and Princes: The Story of Indians in Britain 1700–1947 discovered Sake Dean Mahomed for our contemporary era. We met at the British Library. My first question to her was why she had featured Mahomed in her book. Her answer: “I wanted to rescue him from obscurity.” She explained it was she who had inspired Fisher to republish Travels. The next day I took a 57-minute train ride to Brighton. Within minutes of arrival, to my great surprise, I spotted, on the side of a number 822 city bus, the name “Sake Dean Mahomed.” (He adopted “Sake” as an Anglicization of shaykh in the 1820s.) I soon learned this bus sign was part of a civic campaign to honor notable citizens, and that there are today more traces of Mahomed in Brighton than one might expect. A formal portrait of Mahomed, attired as a Georgian gentleman, hangs in the Brighton Museum, painted by English artist Thomas Mann Baynes. Along the sea, the Queen’s Hotel stands on the site that was once Mahomed’s Baths. At 32 Grand Parade is the house where he died, aged 92. Dean Mahomed was born in 1759 in Patna, today the capital of India’s eastern state of Bihar, about 600 kilometers from Kolkata. According to Mahomed’s autobiographical sketch, his father was a subedar, a military rank roughly equal to lieutenant, the second highest permitted to Indians under British colonial rule. He served in a battalion of sepoys (Indian and Bengali soldiers) in the Bengal Army of the East India Company. Mahomed was 11 when his father was killed in battle. Some years later he took service under an Anglo-Irish officer named Captain Godfrey Baker and, like his father, rose through the ranks. In 1782 Captain Baker decided to return to Ireland, and he invited Mahomed to accompany him. “Convinced that I should suffer much uneasiness of mind, in the absence of my best friend,” Mahomed resigned his commission and left India—never to return. Twenty-five years old, Mahomed settled in 1784 in the small Irish port city of Cork, where he worked for the Baker family on their estate for the next 22 years. 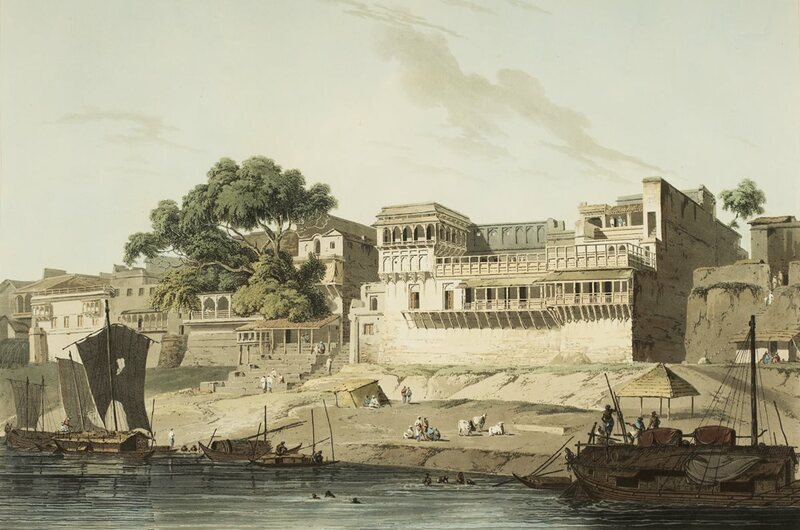 Mahomed was born in 1759 (although he would later change his birth year to 1749) in Patna in India’s eastern state of Bihar, whose waterfront on the Ganges appears in this 1795 engraving. Son of an officer in the colonial army, Mahomed found service under an Irish captain who in 1784 took Mahomed back to the captain’s own home to Cork, Ireland. In 1806, at age 47, Mahomed moved to London and married again. He headed for fashionable Portman Square, home and haunt to former East India Company employees referred to—pejoratively, at times—as nabobs, an Anglicization of the Mughal title nawab. He found employment with the richest nabob of them all, Sir Basil Cochrane, who had made a fortune in India on supply contracts with the British Navy. Cochrane had published several tracts promoting the use of “vapor” (steam) baths to relieve medical complaints, and he had even installed one at his home. Mahomed is believed to have added an Indian treatment of therapeutic massage to Cochrane’s vapor treatment, thus creating the salubrious formula that later was to become the sensation in Brighton. 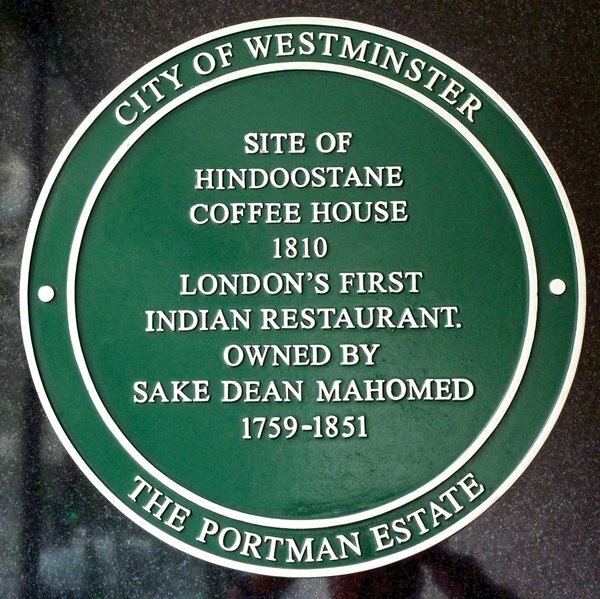 In 1810, around the corner from Portman Square at 34 George Street, Mahomed opened London’s first Indian restaurant, called the Hindoostane Coffee House. The Epicure’s Almanack—London’s first restaurant guide—described it as a place “for the Nobility and Gentry where they might enjoy the Hookha with real Chilm tobacco and Indian dishes of the highest perfection.… All the dishes were dressed with curry powder, rice, cayenne and the best spices.” Despite the raves, Mahomed was unable make it a success. He declared bankruptcy two years later. In Lydia’s imagination, a visit to Brighton comprised every possibility of human happiness. She saw, with the creative eye of fancy, the streets of that gay bathing-place. Brighton’s fame as a health resort began in the 1750s with the dissertation by Richard Russell, M.D., asserting the curative benefits of seawater. There was, however, one problem: Most people couldn’t swim. This led to the development of a bathing apparatus: a small wooden room, fitted with carriage wheels, drawn into the sea by horse. After having disrobed the bather, a professional “dipper” would dunk the patient in the sea one or more times, depending on wave conditions, weather and the client’s fitness. Once the “cure” was complete, the client changed back into street clothes and the horse made the return ashore. 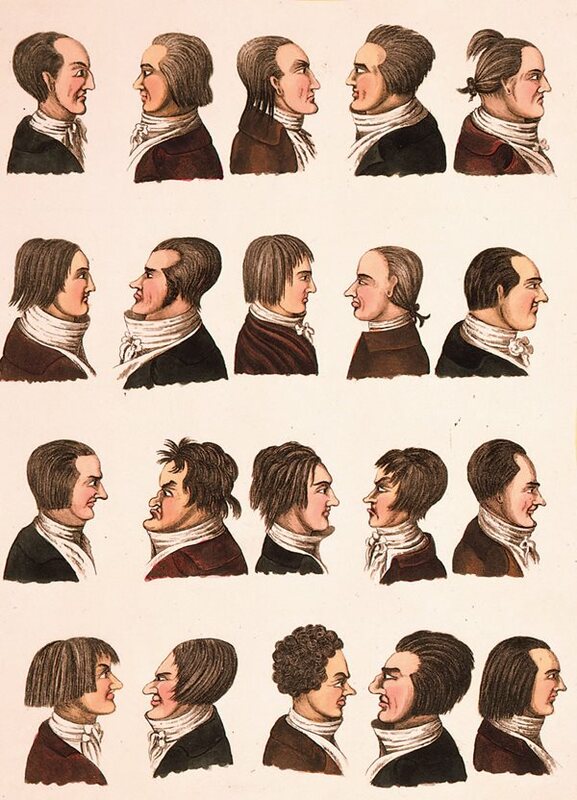 Ridiculing London’s nouveau-riche nabobs—a pejorative play on the Indian title nawab that also references their profits from the East India Company—this illustration of 20 men’s hairstyles dates from 1811, a year after Mahomed opened London’s first Indian restaurant, below, in a district popular among the nabobs. Despite rave reviews, it bankrupted him. Mahomed offered a far more convenient, private and certainly less chilly “cure.” First came a kind of early form of aromatherapy: The client lay in a heated aromatic vapor or steam bath infused with Indian oils and herbs. After the client started perspiring freely, he or she was then placed inside a kind of flannel tent with sleeves protruding inwards that would allow the operator, from outside the tent, to massage the bather vigorously. Mahomed described this process using the Hindi word chámpná, to knead or vigorously massage, eventually adopting an Anglicized version of it and billing himself as a “shampooing surgeon.” (Only later did “shampoo” come to mean hair-washing and hair soap.) It was around this time Mahomed added the title “Sake” to his name. The fashionable invalids were eager for some fresh way of whiling away their time, and the highly scented steam baths were found by many to be far more agreeable than sea-water baths, whether hot or cold, and to sufferers from rheumatism and kindred ailments the massage was soothing and relaxing. There was, moreover, the intriguing sensation that one was enjoying something of the voluptuous indulgences of the East. 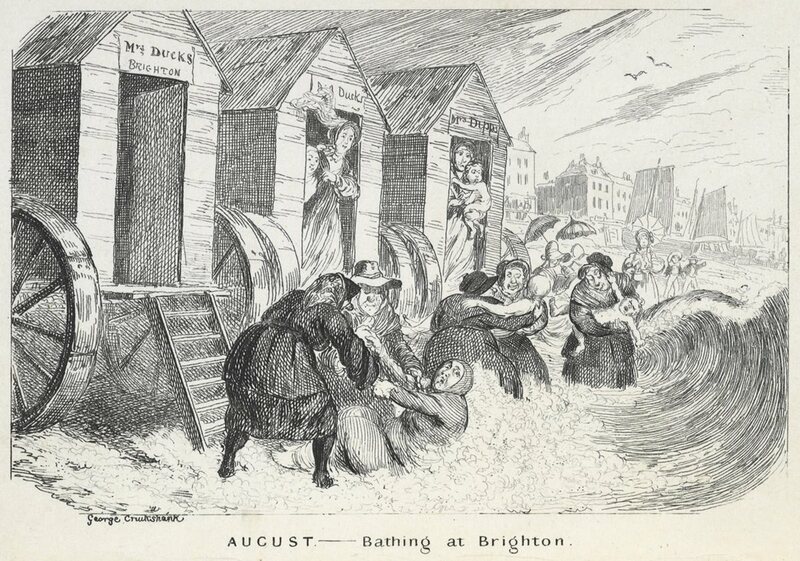 Brighton’s horse-drawn “bathing machines” drew the satirical gaze of artist George Cruikshank and the entrepreneurial gaze of Mahomed, who promoted his “Indian Medicated Vapour Bath” as a healthy, safe, relaxing alternative. 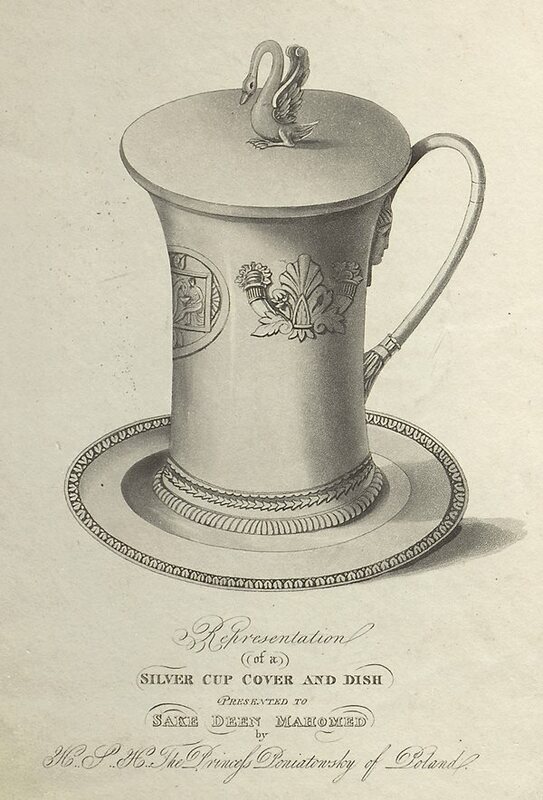 Among the devotees of Mahomed’s bathing techniques was Princess Poniatowsky, niece of the King of Poland, who in 1826 presented a silver cup, cover and dish in gratitude for “perfect recovery in consequence of the treatment.” Mohamed’s own recovery saw him remake his career from a struggling London restaurateur to owner of several successful bathhouses in Brighton and the prestigious title of “shampooing surgeon” to King George iv. 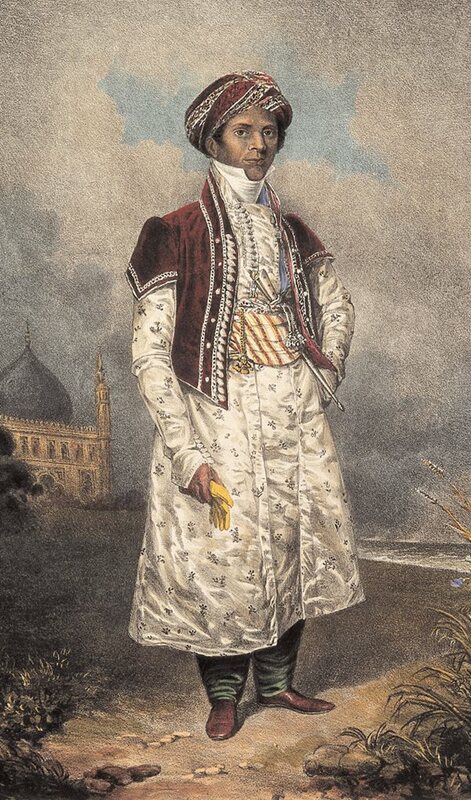 When Mahomed came to the Royal Pavilion to “shampoo” the king, he wore an official costume modeled on Mughal imperial court dress now on display in the Royal Pavilion. But he would have put on something more practical whilst the massaging process took place.… Mahomed did much business with the royal household. Besides baths and shampoos, which cost one guinea each, he sold it bathing gowns of twilled calico and swanskin flannel, and other bathing gear. I shared the honor of following, much later, in the footsteps of Frederick Akbar Mahomed as a consultant physician at Guy’s Hospital working in the same medical specialty, and so inevitably I studied Akbar’s outstanding work in this area. Through finding out about Akbar, I learned about his grandfather Sake Dean, and was instantly captivated. First published in The New London Magazine in 1822, these verses later appeared in Mahomed’s own self-promoting collection of testimonials. 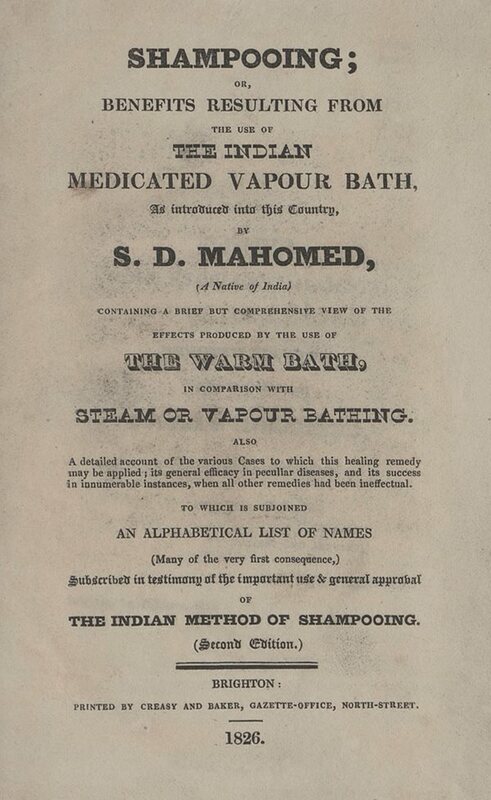 Originally titled Cases Cured by Sake Dean Mahomed, a second edition with the much longer title, Shampooing; or, Benefits Resulting from the Use of The Indian Medicated Bath, as Introduced into this Country, followed a few years later in 1826, with a third edition in 1838. 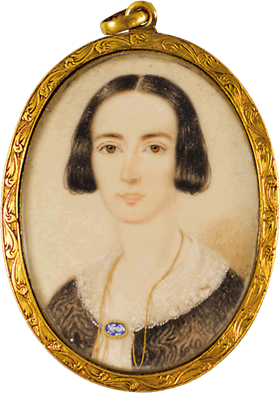 Queen Victoria, after her accession to the throne in 1837, also made several visits to Brighton but, as Musgrave makes clear, quickly found the Pavilion not to her liking. 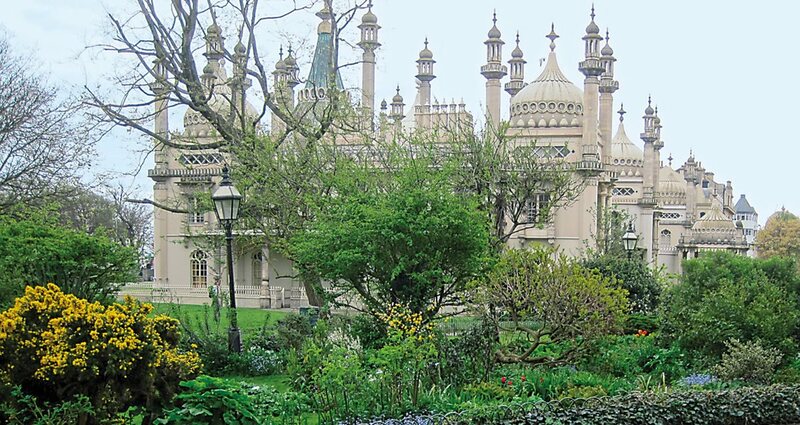 As royal “shampooing surgeon,” Mahomed oversaw the installation of a private steam bath in the Royal Pavilion, the seaside residence of King George iv that had been designed by John Nash as an Indian fantasia around the time Mahomed moved to Brighton. As the pavilion lost its special standing as a royal residence, so Mahomed lost his royal patron. Gerald Zarr ([email protected]) is a writer, lecturer and develop-ment consultant who lived and worked overseas as a US For-eign Service ofﬁcer for more than 20 years. He is the author of a cultural guidebook on Tunisia and numerous articles on the history and culture of the Middle East.